This is an absolutely marvelous compendium of detailed insights into Jewish life in Polish shtetls before the holocaust. Although focused on Eishyshok, much applies to other shtetls as well. I am well along in my new novel set in Germany and Poland during the Nazi years. Recently, though, in re-reading some of what I had written, and comparing it with scenes from my earlier novel The Heretic, I began to feel that I was not adequately capturing the emotion that is my goal. 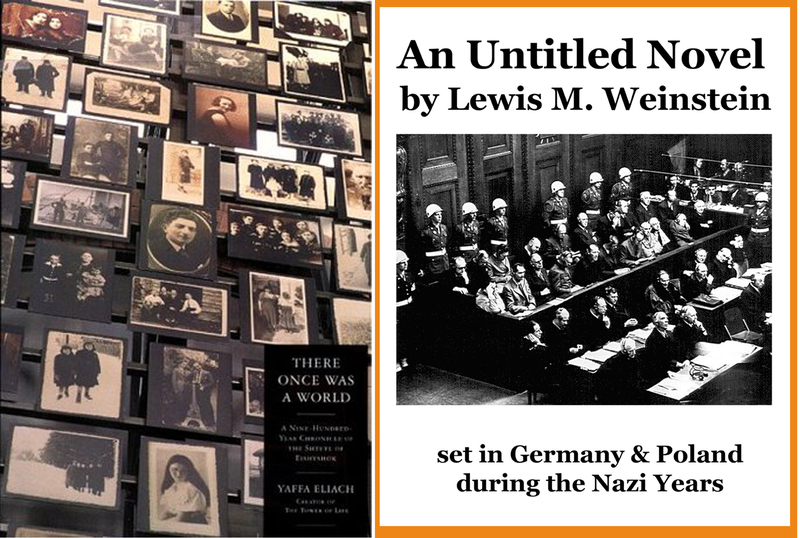 I realized that I had been (necessarily) immersed in scenes about Hitler’s rise to the Chancellorship and I understood what I was feeling, which I can summarize as “too many Nazis, not enough Jews.” It is the Jews who bring the emotion to my story, as they watch from Poland, fearful, hopeful, uncertain and confused. Yaffa Eliach’s book is my cure. Its 800+ pages captures the sense of the shtetl, facing the future that was never to be. Without a trace of hyperbole or any hint of the maudlin, Eliach paints a warm and enduring picture of people who did not live to paint it themselves. A vibrant culture for centuries, Polish Jewry struggled with the dilemmas of the 20th century, balancing Haskalah and Zionism, secular studies and Talmud, open lives and closed. So much potential, which we all know was never to be realized. This entry was posted on March 23, 2015 at 1:18 pm	and is filed under *** Uncategorized. You can follow any responses to this entry through the RSS 2.0 feed. You can skip to the end and leave a response. Pinging is currently not allowed. Hi Lew. I agree that “There Once Was a World” by Yaffa Eliach is outstanding in what it provides in terms of photographs, documents, and commentary as a chronicle of Eishyshok. I have it on my bookshelt. You might also be interested, however, in reading some of the critical commentary about Eliach’s work, along with that of other memorialists of the shtetl. For example, take a look at recent scholarship that suggests that these types of works focus too much on pogroms and the Shoah, and don’t understand or acknowledge that Jews had long periods of time in villages and towns in eastern Europe when they were able to live without fear and had a thriving economy. Take a look at Yohanan Petrovsky-Shtern’s “The Golden Age Shtetl: A new history of Jewish life in East Europe” (2014) and other historians of Polish Jewry such as Gershon Hundert, Moshe Rosman, and Adam Teller who, according to Petrovsky-Shtern “reframe our former vision of the “shtetl” as a victim of political persecution, proving that it had a burgeoning trade and economy, as well as an oppressive and unlikable oligarchy.” They basically turn the Sholom Aleichem view of the ‘typical’ shtetl on its head. Worth checking out. I found the YPS book to be fascinating. Thank you so much for your response. I will definitely read “The Golden Age Shtetl.” I was not aware of it. May I ask how you know of it? I heard Yohanan Petrovsky-Shtern speak (brilliantly) at an international Jewish genealogical conference in Boston in 2013. He hadn’t published this particular book yet, but had published others on equally ground-breaking subjects. As it turns out my son has since gone to do his PhD at Northwestern, where Petrovsky-Stern teaches in the History and Jewish Studies programs. YPS is his thesis supervisor and I thus have learned much more about his work and (unsurprisingly) follow YPS’s career more closely now. The Golden Age Shtetl won the U.S. Jewish Book Prize a few months ago. I’m glad you plan to follow up with his work. Glad to help! I heard Yohanan Petrovsky-Shtern speak (brilliantly) at an international genealogy conference in 2013. I have since learned more about him as my son is now a PhD student at Northwestern University where YPS teaches and acts as his thesis supervisor. All of his work is ground-breaking as he tends to do research that undercuts stereotype in Jewish and Eastern European history. Glad to bring a worthwhile source to your attention! I heard Yohanan Petrovsky-Shtern speak (brilliantly) at an international genealogy conference in 2013. I have since learned more about him as my son is now a PhD student at Northwestern University where YPS teaches and acts as his thesis supervisor. All of his work is ground-breaking as he tends to do research that undercuts stereotypes in Jewish and Eastern European history. Glad to bring a worthwhile source to your attention!